Christopher Pollard is an attorney and humorist who offers his opinions on why America is falling apart in his book, “America: Third World Superpower.” He covers a wide range of topics which most people are concerned about, yet I felt he was a bit one sided. Some will think this is his sarcastic side and will enjoy it. There were several points he made in the book I agreed with; some give food for thought, and others were just a rant. The points he made on the economy and low wages were on point. While some workers have a hard time living on what they are paid, there are those in executive positions who get outlandish salaries and bonuses. I might add in here that sports figures are paid too much, for what they do. Given that many workers receive minimum wage education and training are the key to improving skills and providing a chance to work in better paying jobs. However, some people choose to live off the government and have no interest in making any changes. Being a substitute teacher, as the author once was, does not make one an expert on the state of our education system. Today, most of the teacher’s time is spent in teaching students the skills needed to pass standardized tests, and attending meaningless meetings, leaving little time to teach the basics. In addition, students today don’t want to learn–they choose not to do homework or participate in class, and are rude and disrespectful to adult figures. Many teachers today pay for class supplies out of their own pocket. Parental attitudes are, “deal with it,” and offer no attempt in making changes or parenting their children. Other points of discussion included topics like immigration, lobbying, the military, and health care – all issues holding deep opinions on both sides of the political spectrum. The section on abortion just left me aghast. Again, I am aware this book reflects the author’s opinions through satirical writing, I guess that for me some topics do not have room for satire. Although humor is sometimes necessary to deal with serious topics, most of the topics in this book might be so fresh and current that I found myself forgetting this was supposed to be a satire. While I certainly appreciate the author’s directness with his thoughts, they just didn’t always mesh with mine. 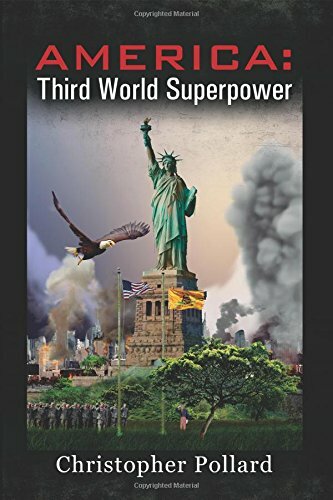 Full of sarcasm and wit on a variety of knowingly tough issues, I’m sure readers who love this type of writing will enjoy “America: Third World Superpower” by Christopher Pollard.